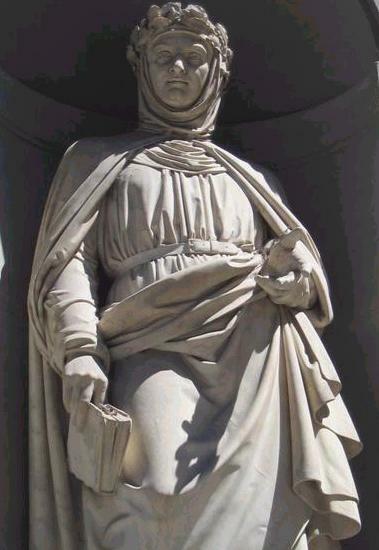 A statue of Giovanni Boccaccio from the Uffizi Gallery promenade in Florence. The harsh-looking face softens as one closes in on it, reflecting what was often written about the man during and after his life, that he was a sensitive, wise, and kind man. Click on the illustrations, or here, to view pages from the Boccaccio, 'The Decameron', hand written in Italian, from Italy, Ferrara; circa 1467, illuminated by Taddeo Crivelli for Teofilo Calcagnini, now on-line at the Bodleian Library. The images of the storytellers and their locations are reminiscent of children's books, but the stories were not for children! 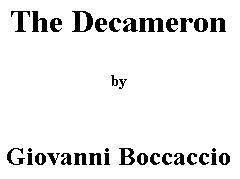 Click on the above text, or here, to go to a different online version of 'The Decameron' in the original Italian. Click on the above images, or here, to go to a wonderful bi-lingual site about Gardens and Villas in Tuscany. This link is to their page on 'Villa Schifanoia' which was built on part of the site of Boccaccio's 'Villa Palmieri'. The image on the right is of 'Villa Schifanoia'. Click on the above image, or here, to visit a lovely site for Garden Tourists listing Italian gardens to visit. On the list is 'Villa Palmieri' which was made in 1870 on part of the site of the Boccaccio's 'Villa Palmieri'. In 1475 Villa Palmieri was depicted in a painting now in the National Gallery in London. 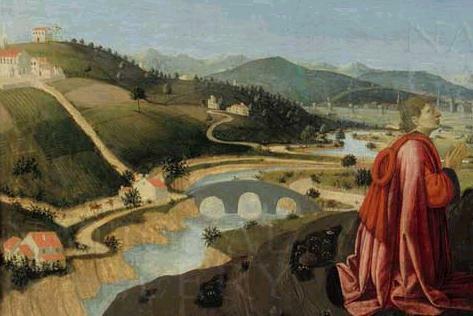 This capture is of the corner where Villa Palmieri is shown at the base of the bridge, with Matteo Palmieri, a Renaissance poet and the man who commissioned the painting, and owner of the property, kneeling as witness to the 'Ascension of the Virgin'. 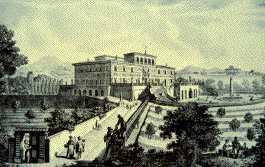 This is an engraving of how Villa Palmieri looked in 1774. It was completely renovated, including the gardens, soon after by the English Crawford family. Click on the above text, or here, to go to an online version of 'The Decameron' in English. Free e-books of The Decameron at Project Gutenberg, the grand-daddy of free e-book websites. To widen your search to the era and contemporaries of Boccaccio, you can use this search tool for Amazon.com. 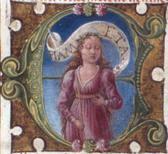 Just enter 'Books' in the 'Search' field, and 'Boccaccio' in the 'Keyword' field. Then click on the 'Go' button to see what's available, what people's comments about the books are, and what they cost. In his 62 years (b.1313-d.1375), Boccaccio was a prolific poet and storyteller in Latin and Italian. He was a close friend of the scholar/poet Petrarch, and a trusted emissary of the rulers of his day. He lived at various times in Naples, Florence, Venice, and Paris, where he was actually born to his French mother as the illegitimate son of a Tuscan merchant. His father’s attempts to make him a merchant, and then a canon failed, and he finally found his own way as a scholar, poet and writer of tales. ‘But the king observing that the sun was now taking a yellowish tinge, and that the end of his sovereignty was come, in terms most courtly made his excuse to the fair ladies, that he had made so direful a theme as lovers' infelicity the topic of their discourse; after which, he rose, took the laurel wreath from his head, and, while the ladies watched to see to whom he would give it, set it graciously upon the blond head of Fiammetta, saying: "Herewith I crown thee, as deeming that thou, better than any other, wilt know how to make tomorrow console our fair companions for the rude trials of today." Early English translations were edited of their bawdiness, just as early editions of A Thousand and One Nights was stripped of its licentiousness in early translations. Only later did faithful translations appear. But even before it was translated into English, English writers Chaucer and Shakespeare borrowed generously from the work. The group of storytellers stay in two villas above Florence which have been determined to be Villa Palmieri in Fiesole, and the Podere della Fonte, or the so-called Villa del Boccaccio near Camerata. Villa Palmieri is open to visitors, and its gardens during Boccaccio’s time are described in great detail in The Decameron at the beginning of Day Three. “Whereupon they went to a walled garden adjoining the palace; which, the gate being opened, they entered, and wonder-struck by the beauty of the whole passed on to examine more attentively the several parts. 'It was bordered and traversed in many parts by alleys, each very wide and straight as an arrow and roofed in with trellis of vines, which gave good promise of bearing clusters that year, and, being all in flower, dispersed such fragrance throughout the garden as blended with that exhaled by many another plant that grew therein made the garden seem redolent of all the spices that ever grew in the East. 'The sides of the alleys were all, as it were, walled in with roses white and red and jasmine; insomuch that there was no part of the garden but one might walk there not merely in the morning but at high noon in grateful shade and fragrance, completely screened from the sun. 'As for the plants that were in the garden, 'twere long to enumerate them, to specify their sorts, to describe the order of their arrangement; enough, in brief, that there was abundance of every rarer species that our climate allows. 'In the middle of the garden, a thing not less but much more to be commended than aught else, was a lawn of the finest turf, and so green that it seemed almost black, flanked with flowers of, perhaps, a thousand sorts, and girt about with the richest living verdure of orange-trees and cedars, which showed not only flowers but fruits both new and old, and were no less grateful to the smell by their fragrance than to the eye by their shade. 'In the middle of the lawn was a basin of whitest marble, graven with marvellous art; in the centre whereof--whether the spring were natural or artificial I know not--rose a column supporting a figure which sent forth a jet of water of such volume and to such an altitude that it fell, not without a delicious splash, into the basin in quantity amply sufficient to turn a mill-wheel. 'The overflow was carried away from the lawn by a hidden conduit, and then, reemerging, was distributed through tiny channels, very fair and cunningly contrived, in such sort as to flow round the entire lawn, and by similar derivative channels to penetrate almost every part of the fair garden, until, re-uniting at a certain point, it issued thence, and, clear as crystal, slid down towards the plain, turning by the way two mill-wheels with extreme velocity to the no small profit of the lord. There was aforetime in the city of Prato a statute no less censurable than harsh, which, making no distinction between the wife whom her husband found in adultery with her lover, and the woman found pleasuring a stranger for money, condemned both alike to be burned. While this statute was in force, it befell that a gentlewoman, fair and lovely beyond measure, Madonna Filippa by name, was by her husband, Rinaldo de' Pugliesi, found in her own chamber one night in the arms of Lazzarino de' Guazzagliotri, a handsome young noble of the same city, whom she loved even as herself. And Rinaldo, very angry, scarce refrained from falling upon them and killing them on the spot; and indeed, only because he worried how he should afterwards fare himself had he given way to the vehemence of his anger, and so done, did he refrain from doing so. Even though he mastered himself, he could not resist recourse to the statute, to accomplish that which he might not otherwise lawfully accomplish, to wit, the death of his lady. So, having all the evidence needful to prove her guilt, he took no further counsel; but, as soon as 'twas day, he charged the lady and had her summoned. Like most ladies that are veritably lovely, the lady was of a high courage; and, though not a few of her friends and kinsfolk sought to dissuade her, she resolved to appear to the summons, preferring to die bravely confessing the truth than basely flee and for defiance of the law live in exile, and show herself unworthy of such a lover as had had her in his arms that night. And so, attended by many ladies and gentlemen, who all exhorted her to deny the charge, she came before the Podesta, and with a composed air and unfaltering voice asked of what he wished to interrogate her. The Podesta, surveying her, and taking note of her extraordinary beauty, and exquisite manners, and the high courage that her words evinced, was touched with compassion for her, fearing she might make some admission, by reason whereof, to save his honour, he must needs do her to death. But still, as he could not refrain from examining her of that which was laid to her charge, he said:--"Madam, here, as you see, is your husband, Rinaldo, who prefers a charge against you, alleging that he has found you in adultery, and so he demands that, pursuant to a statute which is in force here, I punish you with death: but this I may not do, except you confess; so be very careful what you answer, and tell me if what your husband alleges against you be true." “However, if in defiance of my body and your own soul, you are minded to put it in force, 'tis your affair; but, I pray you, do not proceed to try this matter until you have granted me this trifling grace, to wit, to ask my husband if I ever denied him, but did not rather accord him, when and so often as he craved it, complete enjoyment of myself." Whereto Rinaldo, without awaiting the Podesta's question, answered that assuredly the lady had always granted him all that he had asked of her for his gratification. "Then," promptly continued the lady, "if he has always had of me as much as sufficed for his solace, what was I or am I to do with the surplus? Am I to cast it to the dogs? Is it not much better to bestow it on a gentleman who loves me more dearly than himself, than to suffer it to come to nought or worse?" Which jocund question being heard by well-nigh all the folk of Prato, who had flocked there all agog to see a lady so fair and of such quality on trial for such an offence, they laughed loud and long, and then all with one accord, and as with one voice, exclaimed that the lady was in the right and said well; nor left they the court until in concert with the Podesta they had so altered the harsh statute so that thenceforth only such women as should wrong their husbands for money should be within its purview. And Rinaldo left the court, discomfited of his foolish enterprise; and the lady blithe and free, as if rendered back to life from the burning, went home triumphant. Sources: Various including those hyperlinked on this page, and Boccaccio's The Decameron translated by J. M. Rigg, available from Project Gutenberg, and a link on this page.